Federal agencies have formally proposed standards that would raise average car and light truck fuel economy to nearly 50 miles per gallon by 2025, up from the current average new auto fuel economy of about 28 miles per gallon. The National Highway Safety Administration and the Environmental Protection Agency acted jointly to propose standards that will substantially reduce our dependence on oil, save consumers billions of dollars, and reduce tailpipe emissions of greenhouse gases. After the passage of the first Corporate Average Fuel Economy (CAFE) standards in 1975, fuel economy rose rapidly for a decade. But it didn't budge for the next 20 years as fuel prices stayed low and manufacturers produced bigger, higher-powered vehicles, until passage of the Energy Independence and Security Act of 2007, which mandated further progress. 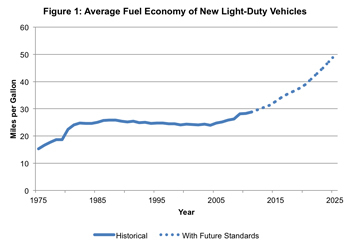 The standards now proposed by the Obama Administration for model years 2017–2025 build on those adopted last year for model years 2012–2016, and would lead to the trajectory of fuel economy for light-duty vehicles shown in Figure 1. 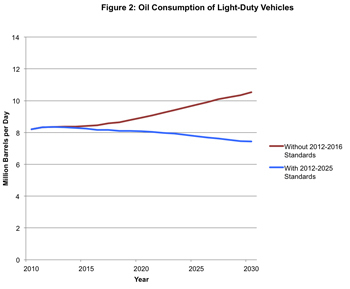 Oil consumption for light-duty vehicles under the 2012–2025 increases in fuel economy is compared in Figure 2 with a business-as-usual scenario. The result is that the upward march of gasoline consumption changes to a downward trend, bringing the fuel consumption of light-duty vehicles in 2030 back down to 1998 levels. The more efficient vehicles would have a higher purchase price, but fuel savings would return that up-front investment and more. Annual net consumer savings (the savings after the increase in vehicle costs is subtracted out) from the 2012–2025 standards would be well over $100 billion per year by 2030, as shown in Table 1. A recurring but erroneous claim about the proposed increases in fuel economy standards is that they will force shifts to small vehicles. 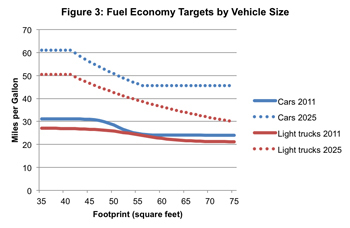 Fuel economy targets now vary with vehicle footprint (the area of the rectangle defined by the car’s tires), allowing bigger vehicles to consume more (see Figure 3). This change was made to accommodate differences among manufacturers’ product mixes and the range of consumer preferences. In fact, auto industry lobbying resulted in a weakening of the proposed standards for large light trucks, and as a result they will need to improve less than smaller vehicles will. So if the new proposal has a weakness, it is that the standards won’t keep manufacturers from shifting toward production of ever-larger vehicles, causing the promised fuel savings to be reduced. But auto manufacturers, most of whom have indicated their support for the increase in standards, must realize that an increasingly global vehicle market and rising gasoline prices together mean that having a strong line-up of highly efficient vehicles will be essential to securing a lasting recovery of the U.S. auto industry. All in all, the new proposal is something to celebrate: an opportunity for a major achievement in energy security and environmental protection, accompanied by a windfall for consumers. Shruti Vaidyanathan contributed to this post.